I would recommend Barbara for any occasion without hesitation. From the moment we asked her to play, she offered a level of professionalism and personalisation which was second to none and the music she played at our wedding was stunning. Nothing was too much trouble. She adapted two of our favourite pieces of music for the occasion and interpreted them beautifully. She also captured the mood of our wedding and how we wanted our friends and family to feel before the ceremony and during the drinks reception in a way which is hard to explain but was really quite special. We also loved the little touches that Barbara offered us, including reflecting our colour scheme into her materials for the day. Barbara is one of the loveliest people I have ever had the pleasure to know and one of the most extraordinary musicians. It was an honour to have her play at our wedding. 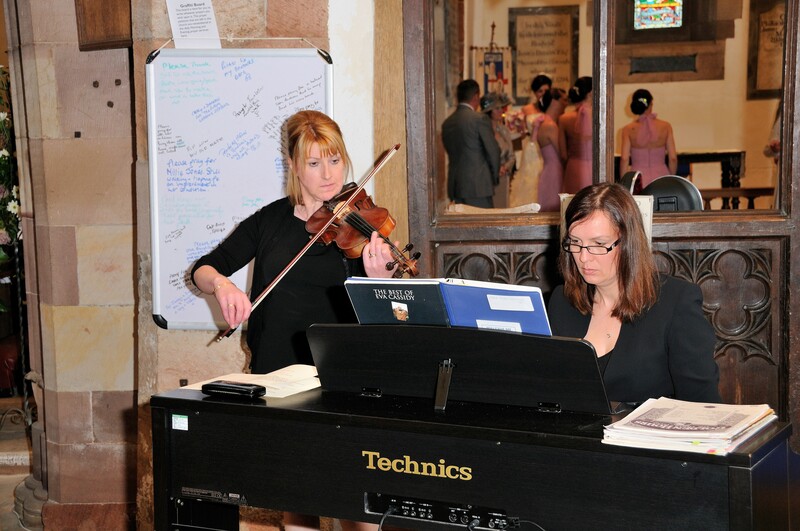 We want to say a huge thank you for the fantastic music at our wedding on 6th April 2013. It made the day all the more special and personal. After meeting with you to talk about what we music we would like, we had every confidence that it would run smoothly and sound beautiful on the day, which it did. From the church, into the reception and then throughout the evening your music helped to set the tone of our wedding day perfectly and we really appreciated your hard work and complete professionalism. 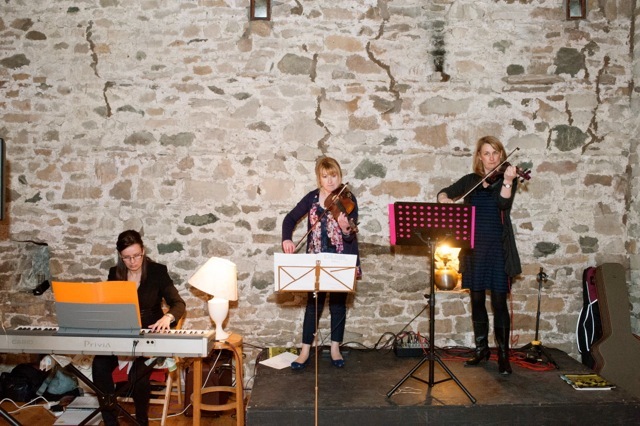 We especially enjoyed the ceilidh in the evening and all of our guests are still telling us what a fun time they had! I could not recommend Barbara highly enough. From start to finish she made the experience of choosing the music for our special day a special one. The music was perfect for us and for our day. Barbara helped to choose pieces that linked together and fitted in with our style. She had thought of every little detail and worked to compose pieces of our choosing to perfection. The performance itself was well rehearsed with us before and ran perfectly on the day. So many have commented on how beautiful the music was and we could not agree more. Now the music holds a lifetime of memories for us and brings a happy tear to my eye every time I hear it. Thank you for your highly professional service Barbara. I would strongly recommend you to anyone wishing to make their day extra special. I’ve played with Barbara on various occasions now and they are always eventful! From concerts with our choir, ‘Middle Eden Voices’ where Barbara, who really should get a box to stand on, conducts with confidence and flair, to the sad occasion of a funeral. Not forgetting the harvest festivals we have attended and even helping the WI with a singing evening. But I definitely think that playing for someone’s special day is a privilege and we have now been a part of a few. Being able to provide someone with musical memories gives you such a good feeling. It means we get to play such a variety of music too, you just never know what you are going to be asked to play. It gives us something to aim for, we need to make sure that everything is just right for the occasion. Barbara loves to play the slower pieces and I enjoy something with a bit of a challenge. I know this is supposed to be work but I truly am pleased that this is my job!! I am fortunate enough to know Barbara as a parent of one of her students, as a singer in the choir of which she is the choir mistress and as a member of a support group for those with a brain injury taught by Barbara. In all of these roles Barbara is well prepared, patient, and above all good fun, which is great for me too as I have been lucky enough to play alongside her at a number of events. Middle Eden Voices is a community choir founded on Barbara Gilbertson’s belief that everybody has the ability to sing and her determination that we should all have the opportunity to experience the joy of singing in a choir. There is no audition, membership is free, we meet weekly in term time and all are welcome. Barbara leads us with passion, skill and humour. She builds our skill and our confidence, extending our range and inspiring us to master music that initially seemed beyond our capability. Sometimes it is hard work but we invariably come away refreshed and stimulated. We perform several times a year, usually at charity events. Where possible, those events involve school choirs giving the children an opportunity to sing in a big choir and to blend their voices with those of adults. It’s a great joy! Both Barbara and Jane Bainbridge, our accompanist, are professional musicians and teachers leading busy lives but they give their time for nothing so that our choir can be free and accessible to all. We have much to thank them for as, without their skill and generosity, many of us would not be singing. Like many people, I was told as a child that I could not sing. Barbara would tell you that the fault lay in my teacher’s failure to help me to find my voice rather than with me, but I did not know that then. For forty years I carried a sense of inadequacy and a secret sadness because I couldn’t sing in tune. If I tell you that, remembering those times as I write this I have tears in my eyes, you will perhaps understand how big an issue that was for me. When I met Barbara I realised that here, at last, was somebody who could help me. I can’t tell you how much courage it took to stand beside Barbara’s piano and try to sing the note she was playing. I managed to squeeze out a sound of sorts but it wasn’t good and there wasn’t a lot of it! However, Barbara made me feel safe and gave me courage to go on. Barbara has music in her DNA. It is central to her life and she thrives on sharing her knowledge and her skill. Most importantly she is kind and she has great empathy. She understood how I felt and has been unfailingly kind and supportive, always finding something constructive and encouraging to say. When I go wrong she helps me to identify the problem and find a solution. When I do well, her face lights up and she enjoys my success at least as much as I do. My singing is far from perfect but Barbara tells me my pitching is improving and I am developing tone and phrasing. Amazingly, I’m finding my voice and enjoying using it!! I can’t thank Barbara enough or recommend her too highly. It was such a wonderful day and we would have liked to have thanked you in person on the day, it all just happened so fast! We were so happy you were able to play outside and everyone commented on what a great atmosphere you helped create. I was thrilled to have found Middle Eden Voices choir to perform a flashmob surprise for my parents ruby wedding anniversary dinner. Their repertoire and singing surpassed any expectations we could have dreamed of, and the surprise element was executed perfectly. I can’t express my thanks enough to Barbara and the rest of the choir for all the help in organising and pulling off such a fabulous evening.